I got this gigantic movie poster for being one of the first people to pre-order tickers for the screening. Nifty ain’t it? 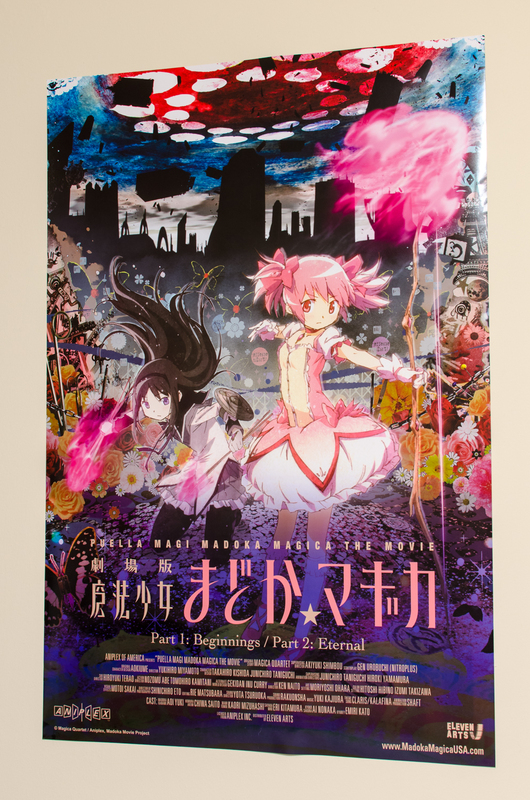 Earlier this month, the first two Mahou Shoujo Madoka Magica movies finally came to the fine city of Toronto — at a theater right across from my flat, no less! The sold out theater looked like any anime convention in this part of the world: dressed up and disproportionally Asian. There was a festive air at the screenings, and if the Madoka movies ever do show up in a city near you I would whole-heartedly recommend attending for that bizzaro-world vibe alone. If you are curious about actual movies, don’t be — these movies don’t really add anything new to the series. There are some new cuts here and there (most notably some spiffy transformation scenes), but they’re fairly inconsequential and most of them would go by unnoticed unless you’re comparing them side to side with the TV series like the nerd you probably are. Rather, these movies simply a slightly dressed up version of the original series that retains the integrity of the storytelling, nothing more. If you’ve never watched the series before, you wouldn’t be missing much if you dived straight into the movies. The Gurren Lagann movies these are not. However, the movies are a good occasion/excuse for fans of the series to revisit the story — a perfect way to reflect on the little SHAFT show that took the world by storm. It’s been a long while since I watched the series, and I’ve forgotten the a lot of Madoka‘s quirks. The first movie made me look down at my watch far too often, while the second movie warmed my heart enough to make me think twice before writing a tl;dr textual smackdown. So instead of a smackdown, this not-so-little post is a gentle putting down of Madoka — a retrospective on the series and a couple of the storytelling problems that irked me during my two-part re-visitation.